Monday’s session saw a buoyant start to the Week. The Markets saw a opening in lines with expectations and traded in a range in the first half of the session with modest gains. We saw strength coming in especially in the second half. The benchmark Index NIFTY50 got further fortified and ended the day with decent gains of 97.25 points or 0.92%. The Markets have resumed its up move after a brief corrective spell after testing the immediate past high level of 10784. As we walk into Tuesday’s trade, we see the upbeat sentiment persisting. The Markets are likely to enjoy a positive start to the day. This being said, Markets still face chances of consolidation at higher levels and the levels of 10784 will remain important levels to watch for. Markets are still theoretically expected to face resistance at those levels if we speak of immediate short term. 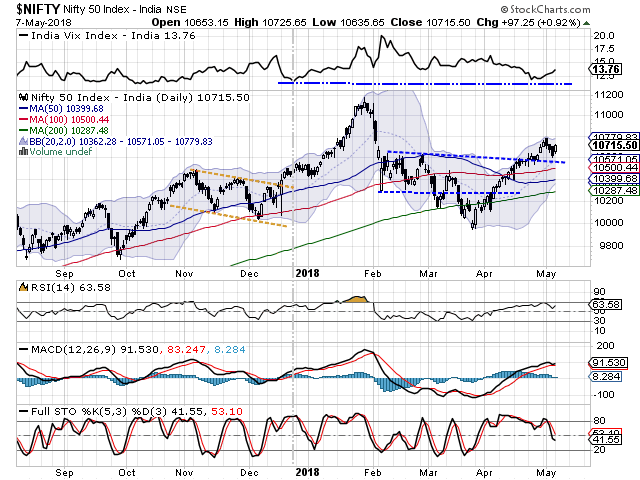 The levels of 10765 and 10790 will act as immediate resistance area for the Markets. Supports come in at 10675 and 10630 zones. 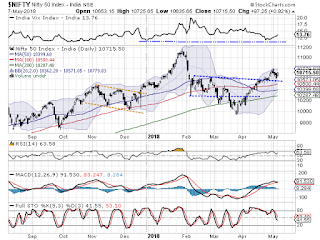 The Relative Strength Index – RSI on the Daily Chart is 63.5806 and it remains neutral showing no divergence against the price. The Daily MACD stays bullish while trading above its signal line. Pattern analysis reveals that after achieving a breakout from the broad rectangle zone, the NIFTY suffered a classical throwback and suffered a minor corrective decline. After a brief consolidation, NIFTY has resumed its up move. Key would be to see if it faces resistance once again at 10784 levels. Overall, a modestly positive, but quiet start is expected in the trade on Tuesday. It is advised not to attempt to create shorts at higher levels. We will continue to see stock specific performance. The undercurrent remains very much buoyant. The levels of 10784 will be important to be watched as the Markets may face resistance at higher levels. Even if some resistance is found at higher levels, the Markets will see more consolidation once again in a given range than outright correction. We continue recommend making stock specific purchases with any decline that the Markets offer. While continuing to guard profits at higher levels, neutral to positive outlook is advised for the day. Fresh long positions were seen being added in FEDERAL BANK, NATIONAL ALUMINUM, EXIDE INDUSTRIES, JSW STEEL, ICICI BANK, RNAVAL, POWER GRID, PFC, HINDPETRO, YES BANK and TITAN.